Not a dream! Not a hoax! Not an imaginary story! 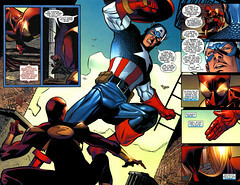 Courtesy of the Internet, I’ve been reading Marvel’s recent comics “event” Civil War. Like all such comics crossovers, it’s largely an excuse to have superheroes get into fights with one another. What makes it actually rather enjoyable, though, is that the excuse in this case is a thinly-veiled version of the US government’s response to 9/11. There’s something fun about seeing superheroes beating each other up while attempting to debate the war on terror in old-school Marvel dialog. Mildly dumb though this is, it’s also extraordinarily charming in its ambition. For any form of popular entertainment these days to escape the solipsism of “postmodern” nostalgia is encouraging, and it’s particularly unexpected in superhero comics, a genre which appears to have been getting progressively more hermetically self-absorbed for the past 20 years.